It's funny how some places seem to always fall into the category of 'I'll go there next time'. 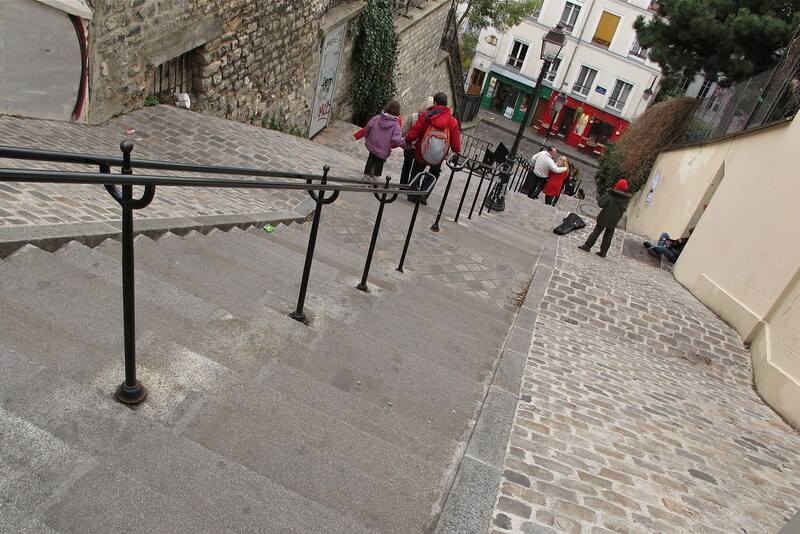 Montmartre has been on my list for the past three years, and every time I'm in Paris, something gets in the way. I had an unexpected free afternoon yesterday, and - despite the terrible weather - I went to have a look. I knew the weather would mean missing out on the fantastic panoramic view of Paris, but the hill has more to offer. Touristy shops aside, it has a slightly different feel to Paris. 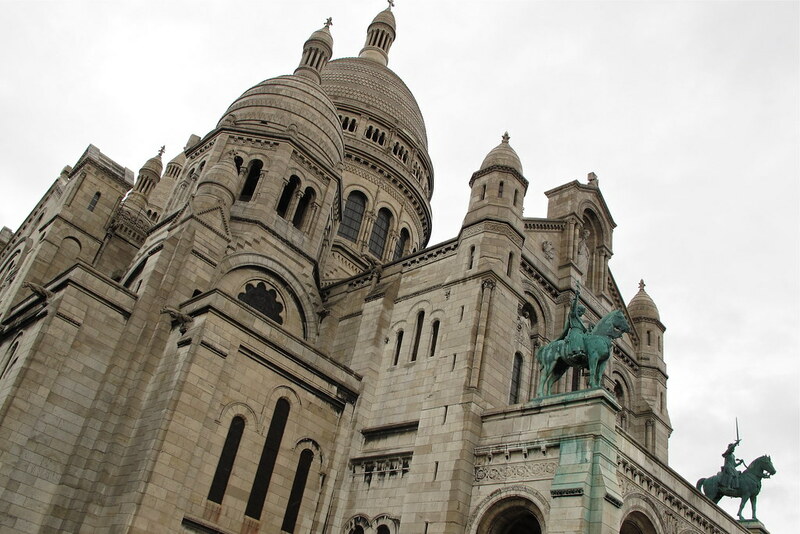 The Basilica of the Sacré Cœur, the artists-and-entertainers and the lovely little museum - set in the oldest house on the hill - can fill an afternoon and more. 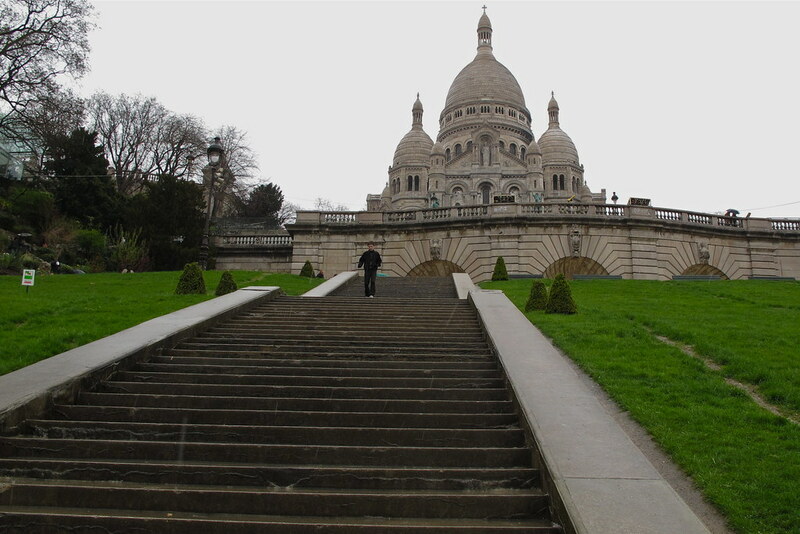 Rain was probably the worst weather for such a place, so on a nicer day, Montmartre would be even more charming. 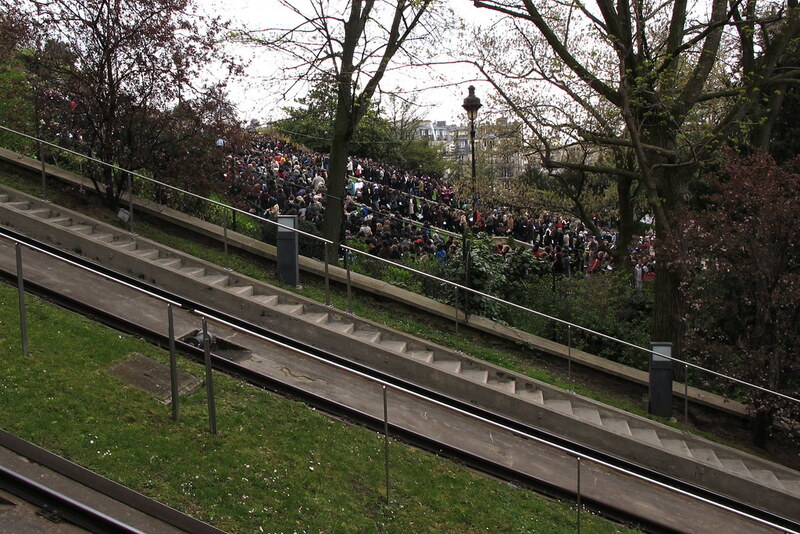 Despite the rain, the staircase to the Basilica was full. I wonder if this was a special service for Good Friday. Please excuse my ignorance, and feel free to comment with more information. I managed to go inside the impressive building - but sorry no photography is allowed. 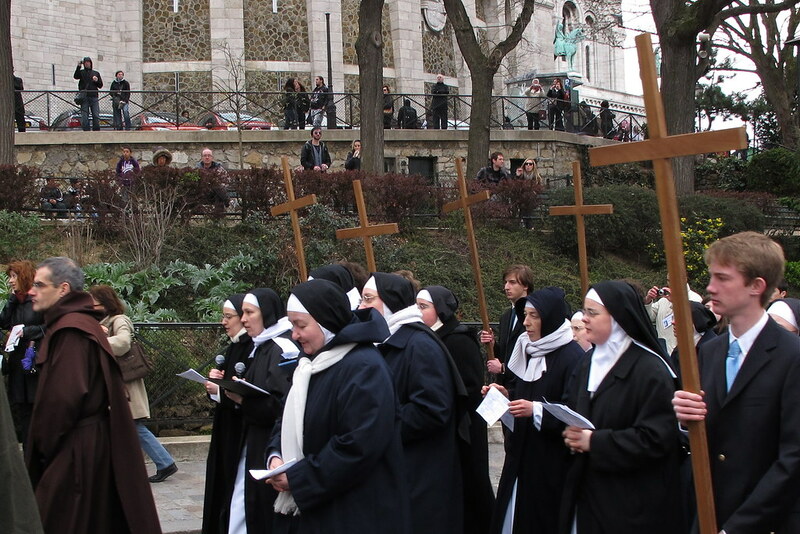 I managed to get these shots of their short walk and prayers in the grounds. They had beautiful voices. To my friends and readers who celebrate it, I wish you a Happy Easter and good health. 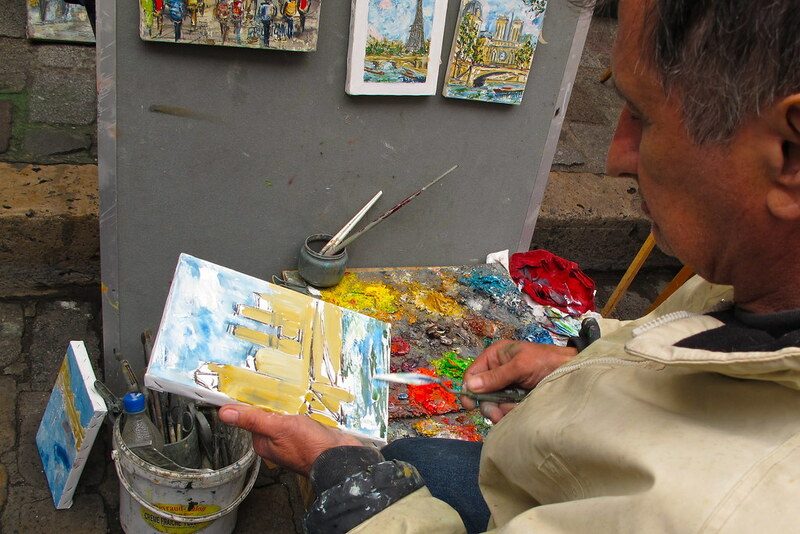 Amazing Pics as usual and yes Montmartre is a must! :) That was it... Those couple of hours were my 'nice time in Montmartre'... Back home now. I remember going there and so many artists around! So many people walking around and lots of fun! 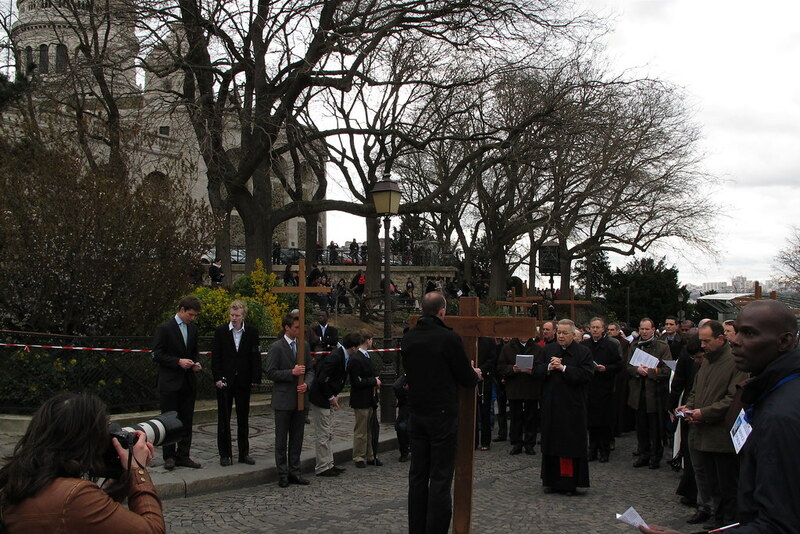 Of course the service was for Good Friday - one of the holiest days of the year. Your lovely photos made me want to go there. I love your pictures. Magnifique! Elles sont vraiment belles! 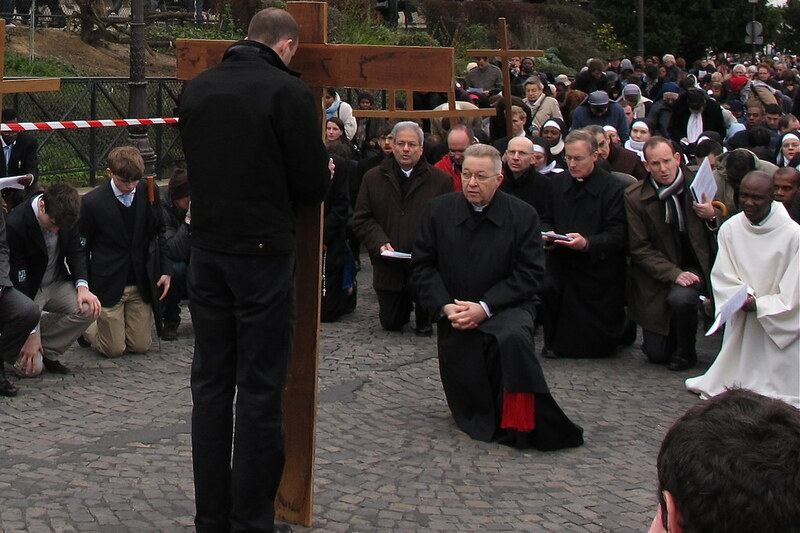 Love the picture of the man bowing his head against the cross. Lovely pictures of a very special event. Good Friday was a bad day for Christ, being beaten and tortured on the cross, but a good day for those who believe that it was for a good reason he suffered so. A bittersweet holiday. Nice post and nice photos of the most beautiful place in Paris (in my opinion). Nice photos. You "really, really" need to be there when the skies are clear to catch a fab view (best view in town) of the Eiffel Tower. Maybe next time! As usual, you are amazing Bu-Yousef. I liked the staircase picture. Montmarte...always been my favorite part of Paris!! And so beautiful in your pics even on an overcast day. Great photos!! Thanks for the lovely pictures of - two or three years since I have been there - felt quite homesick!! Lovely part of Paris even in bad weather as there are such snazzy cafes for a hot coffee and cognac to warm one up!! Wow love the pictures!!!!!!!!!!! Mine weren't even half as good!!!!!!!!! Thanks. It was brief but fun. Will find another opportunity I hope. Looks like a formal Catholic Good Friday service. We’ve had a casual one at the orphanage in China on Friday and fire works on Easter Monday with the kids. 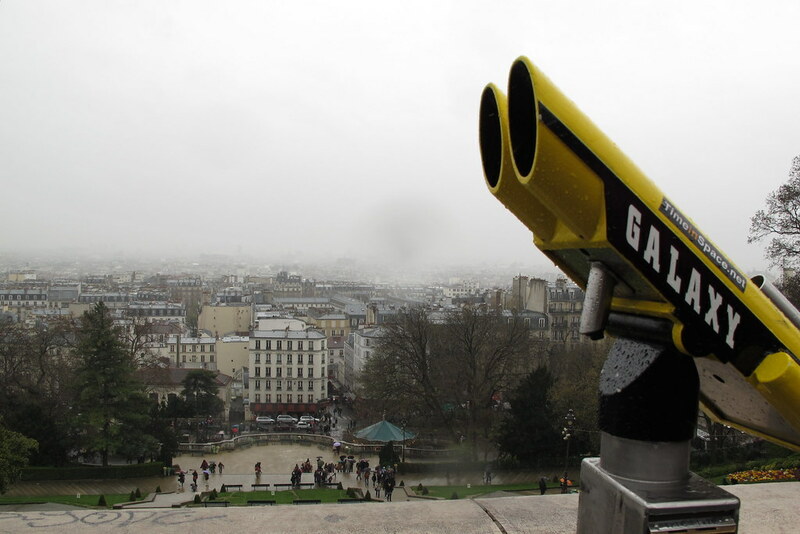 Actually rain would add some sad tone to the service in Montmartre, don’t you think? That's the place. I had heard so much - and had to see it for myself. Any picture that captures emotion becomes an interesting one. You obviously see beyond the prayer/service itself. 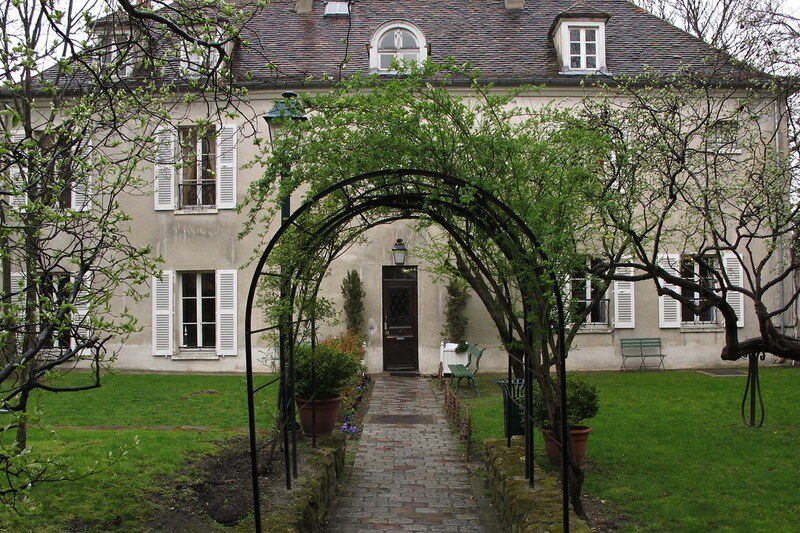 It is a very nice part of Paris. But I prefer Paris 'proper'. This was like being outside London in Hampstead or Richmond: Lovely but not the real thing. I can see how a place like this is missed. I'm sure different weather conditions bring out different sides to the place. Thank you. Will try and find yours on your blog.